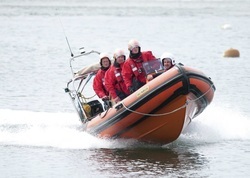 The aim of this course is to teach boat handling, seamanship, pilotage and navigation up to the standards required to drive a planing powerboat safely by day and night in tidal coastal waters. Candidates should be competent to the standard of RYA Intermediate Powerboat (coastal) with a knowledge of navigation and chartwork to the level of RYA Dayskipper. Start and finish times for the advanced course vary depending on time of sunset. Preparation for sea, boat handling, passage making and responsibility as skipper, pilotage, meteorology, rules of the road, use of engines, emergency situations, night cruising. Candidates should be competent to the standard of the Intermediate Powerboat Certificate with navigation and chart work to the level of Day Skipper Shorebased certificate. First Aid Certificate - click here for a list of acceptable first aid certificates.